Uganda is a unitary republic with an executive president elected every five years by universal adult suffrage, and a unicameral parliament with 375 elected members. Most of these members (238) are directly elected every five years by universal adult suffrage. The remainder are elected from special interest groups by electoral colleges: women, the defence forces, youth, disabled people and workers. Since 2005 there has been no limit on the number of terms a president may serve. The president appoints and leads the cabinet. The prime minister, appointed by the president, assists the president in the supervision of the cabinet. The constitution of 1995 provided that until 2000 elections were to be held under the ‘movement system’, whereby candidates stand as individuals to be elected on personal merit, rather than as members of a political party. The ‘movement system’ ended in 2005 when the people voted in a constitutional referendum in favour of introduction of a multiparty political system. The constitution provides for independence of the judiciary. 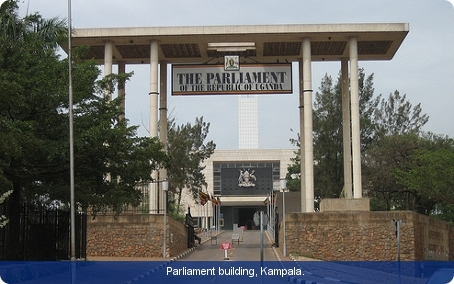 The Supreme Court is the final court of appeal and the constitutional court. The Court of Appeal hears appeals from the High Court. The High Court has unlimited jurisdiction in civil and criminal cases. The magistrates’ courts have limited jurisdiction in civil and criminal cases. Appeals arising from the magistrates’ courts are heard by the High Court. The country seems to have been inhabited very early. Bantu peoples were engaged in agriculture from 1000 BC. In the fertile south and west, powerful kingdoms developed, including the Bunyoro and Buganda kingdoms. Various Europeans began to arrive in the 19th century. Although control of the country passed to the British Colonial Office in 1905, Uganda, in some respects, was never fully colonised, as non-Africans were not allowed to acquire freeholds. The gradual transfer of power to the local people began in 1921. Uganda became fully independent in 1962, and Sir Edward Mutesa became Uganda’s first (non-executive) president in 1963. Milton Obote served as prime minister between 1962 and 1966. In 1967 the country became a unitary republic, with Obote as president. The kingdoms were abolished and the president became head of the executive as well as head of state. Obote remained in power until 1971, when he was ousted by army general Idi Amin. In 1979 Amin was overthrown and he fled the country, dying in exile in Saudi Arabia in 2003. Obote’s Uganda People’s Congress (UPC) was re-elected, and the government became involved in fighting with the National Resistance Army (NRA). Obote was overthrown in a coup in 1985 by the national army. This did not satisfy the NRA, who went on to wrestle power from the army. In 1986 Yoweri Museveni leader of the National Resistance Movement (NRM), the NRA’s political wing, and the NRA itself became President of Uganda. During 2003 he publicly committed himself to the reintroduction of multiparty politics, and in 2004 he announced that he had retired from the military, while remaining army commander-in-chief. This opened the way for him to participate in multi-party politics. In the first multiparty elections for 25 years, held in 2006, Museveni defeated Dr Kizza Besigye of the Forum for Democratic Change (FDC) in the presidential election. Museveni also won the presidential election of 2011, winning 68.4% of the votes cast. The concurrent parliamentary elections were won by the ruling NRM.